Upgrades and Updates: Over the last few years, the rooms all got a fresh look with new paint, window treatments, soft goods in 2015 and 2016, new deck furniture and more. In 2016, Country House added granite vanities in all of the main and 2nd building rooms and in the Penthouse, new paint and carpet throughout, new granite vanities in the bathrooms and some new furniture. The suites have gotten new furniture pieces over the past year or so. And new tile flooring and furniture in the lobby and added an outdoor fire table in 2015. And lots of little things like new room directories, outdoor furniture and umbrellas. Like we said, the owners continue to make this property more and more spectacular! But don’t get sidetracked by the freebies. Country House Resort offers the adult vacationer (kids under 13 not allowed) spectacular balcony views of Sister Bay, an attractive 1,100 ft. shoreline, gas fireplaces in many of the rooms, an outdoor pool and spa area that makes you feel as if you’re at an island resort, and an attentive staff to make your getaway truly memorable. This is a fabulous place, that is dog freindly as well! You can leisurely hike a scenic walking trail all the way into town – the grounds and surrounds are gorgeous, with views of Sister Bay like no other! But there are also meeting and conference facilities that can accommodate up to 25 workaholics. Now for the details. Each of the 46 modern-design rooms and suites has their own refrigerator, coffee service, phone, cable TV, DVD/VCR/CD player, and hairdryer. Most have private balconies overlooking the bay. And specialty rooms include two-person whirlpool, two-person body spray showers, queen or king bed, wet bar, and microwave. The luxury suites are either 600 sq. ft. one-bedroom units or 800 sq. 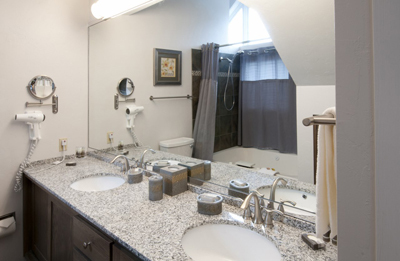 ft. two-bedroom-two bathroom units. 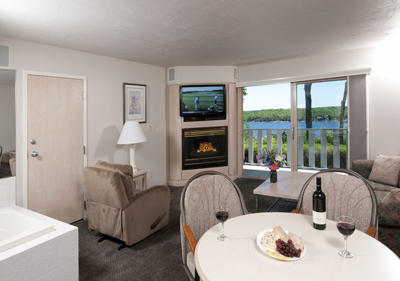 Country House Resort also has a luxurious two-bedroom/ two-bathroom penthouse with the hands-down best view of Door County, a full kitchen, fireplace, and whirlpool bath and reading room. 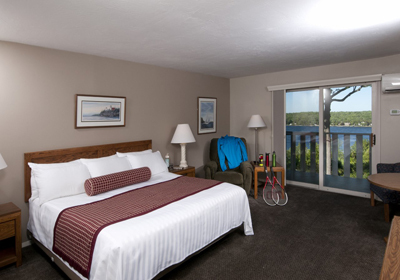 Rates have a wide range based on room type and time of year ($80 - $338). Always check with the innkeeper. 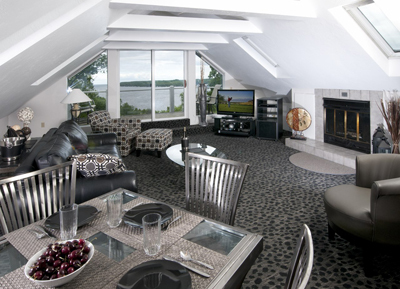 The Penthouse Suite (1,600 feet), which is spectacular with great views, goes from $190 - $338 depending on the season, Always check with Country House Resortor the resort's website to get the full and current rate schedule. There are great discounts during the "quiet season," and also special rates for Sundays through Thursdays too. Always check their Specials & Packages too. Country House Resort website is packed with great information. Watch the video above to get a great look around the resort. The video is very informative and provides a wonderful view of the resort and what to expect. We've been there for you and it will be like we say! And they are open through the Winter too! 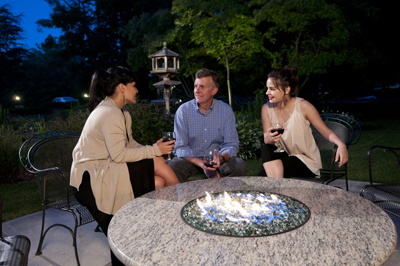 A favorite for anniversaries and honeymoons, couples and friends, Country House Resort provides everything from a brisk walk in the woods to a snuggle by the fire. It’s definitely one of our favorites. We have revisited Country House Resort many times, and they keep making it better and better! We think you will agree! So be sure to check them out, and when you do, please tell them that DoorCountyNavigator.com sent you to them! This is Property ID# DCNAV-715.